Nicknamed "Choogs"… Attended the University of Nebraska where he twice earned All-American honors… Has three older sisters, twins Shelly and Carrie, and Laurie… Lists Walter Ray Williams Jr. as his toughest opponent… Enjoys golfing and fishing in his spare time… First job was as a pin chaser… Grandparents owned a bowling center until he was 14 which is how he got into the game... Michael's shirts have his grandmother's initials embroidered on them - she passed away August 20, 2002… Won the Bowlers Journal Doubles (1997, 2000), four mega-buck sweeper titles and five World Team Challenge titles… Known for his famous "Machuga Flop" he sometimes performs during Pro-Ams… He also performed the trick after winning his first career title in 2005-06. In 2008, Mike had a steady season in which he posted four top-10 finishes but failed to make a TV appearance for the first time in his career… Started off strong with a fifth-place finish in just the third event of the season, the 2007 Etonic Championship where he fell to Chris Barnes, 4-3, in the Round of 8… Missed match play in five of the next seven events before a strong stretch where he made match play in seven of eight events… Finished sixth in back-to-back weeks, teaming up with Dino Castillo to finish sixth in the PBA Exempt Doubles Classic and also posted a sixth-place finish in the H&R Block Tournament of Champions, his best Major finish… Two events later, finished eighth in the Pepsi Championship, falling just 62 pins short of the finals… Overall, made match play in 13 events, tied for 13th on Tour… His 217.47 average ranked 17th. 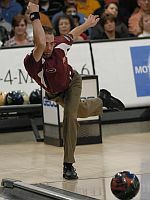 Career: Owns one PBA Tour title which came in the 2005 Greater Omaha Classic after he had finished second three times in his first 81 events… Made a career-high $103,980 in the 2005-06 season… Is 10-9 in 10 TV singles appearances with a 209.53 average… Owns one PBA Regional Tour title and has won $20,759 in regional winnings… Has $436,242 in total PBA winnings.